This is a reposting of a piece I wrote for my Tattered and Lost Vernacular Photography site. It was posted on Dec. 9, 2009. Since then, over the years, I've received a lot of comments from people who also had a soft spot in their hearts for this ship. Today I received a comment from the brother of the Medal of Honor receipt, Sergeant C. E. Mower who the ship was named for. I felt it necessary to repost for all to see. His brother was a hero who lost his life in order to save others during World War II. Yes, that war is long ago and many of those who personally remember it are passing on, but we need to remember if only for a few moments those who did great things in service to our country and their comrades. Click here to visit the original post and to see all the comments. I have included the most recent one from Sgt. Mower's brother at the end of this post. Searching through a drawer last night, hunting for my grandmother's watch, I came upon this card. Every so often I find this card hidden in the bottom of the drawer covered by clothing. This is a card my mother wrote to her mother in the early 1950s. This is the ship I sailed on when I was around 18 months old. My family was on their way to Midway Island where we would live for a year. This ship, the Sergeant C. E. Mower, sailed from San Francisco to Hawaii transporting military personal and their families. Until now the mere mention of Sgt. Mower would bring laughs in our home because of the memories my folks have of the roughest sea voyage in their lives. But then tonight I decided to do a little bit of research online and came to have a more clear perspective of the history of this, as my mother called it, "crate." The following is from Wikipedia and is quite interesting. USS Tryon (APH-1) was laid down as SS Alcoa Courier (MC hull 175) on 26 March 1941, by the Moore Dry Dock Company, Oakland, California and launched on 21 October 1941 sponsored by Mrs. Roy G. Hunt. After the attack on Pearl Harbor, she was designated for U.S. Navy use and assigned the name Comfort in June 1942. Comfort was renamed Tryon on 13 August 1942, acquired by the U.S. Navy on 29 September 1942, and commissioned on 30 September 1942, with Comdr. Alfred J. Byrholdt in command. Tryon, an Evacuation Transport, got underway for San Diego on 9 October 1942 and departed from there on the 21st, bound for New Caledonia. On 7 November, she arrived at Noumea; joined the Service Squadron, South Pacific; and remained with that organization for the next 15 months, evacuating combat casualties from the Solomons to Suva, Noumea, Wellington, Auckland, and Brisbane. On her return trips to the forward areas, she carried priority cargo and troops for forces fighting the Japanese. Tryon's first combat duty came in the Marianas during the summer of 1944. On 16 July, she joined Task Force 51 at Lunga Point and sortied for the invasion of Tinian. The hospital transport arrived off the beaches on the 24th, combat loaded with troops and equipment. After unloading, she embarked casualties for a week and then got underway for the Marshalls. The ship called at Eniwetok, New Caledonia, Espiritu Santo, and the Russell Islands before anchoring off Guadalcanal on 27 August 1944. Tryon embarked 1,323 Marines of the 1st Marine Division and sortied on 8 September 1944, with Transport Division 6 of Task Force 32, for the assault on the Palaus. She was off the beaches of Peleliu on the morning of the 15th and disembarked elements of the assault wave. Then, serving as a hospital evacuation ship, she embarked 812 combat casualties and, on the 20th, stood out for Manus. She disembarked the patients at Seeadler Harbor four days later and headed back to Peleliu the next morning. The ship remained off the beaches from 28 September to 4 October and then joined a convoy bound for the Solomons. When Tryon arrived at Tulagi on 11 October, she was assigned to the 7th Fleet to participate in the Leyte campaign. She called at Hollandia and Humboldt Bay en route and reached Leyte on the 30th. The ship completed unloading the next day and began the return voyage to the South Pacific. The transport loaded troops and cargo at Langemak Bay from 13 through 27 December and headed for Manus on 28 December 1944. On 2 January 1945, Tryon stood out of Manus with Task Group 77.9, the reinforcement group, for the invasion of Luzon on the beaches of the Lingayen Gulf. She arrived off San Fabian on the morning of the 11th and began unloading troops and supplies. From 13 to 27 January, she received casualties on board and headed to Leyte Gulf where they were transferred to USS Hope (AH-7) and USS Bountiful (AH-9). On 2 February, she joined a convoy and departed for the Solomons. On 22 February, the evacuation hospital ship got underway and proceeded via Pearl Harbor to the United States for an overhaul. She arrived at San Francisco on 11 March and remained in the navy yard until 20 May. After refresher training in San Diego, she sailed for Hawaii on 3 June and arrived at Pearl Harbor the following week. The transport then called at Eniwetok, Guam, and San Francisco before returning to Hawaii on 2 August. The next day, she headed for Guam and arrived there on the 15th to hear that hostilities with Japan had ceased. Tryon was routed to the Philippines, embarked occupation troops at Leyte, and joined a convoy for Japan on 1 September. The transport disembarked the troops at Yokohama and received liberated Allied prisoners of war en board for transportation to the Philippines. She disembarked them at Manila on the 18th. On 1 October, Tryon was assigned to the "Magic Carpet" fleet which was established at the end of the war to return troops to the United States. She served with it through the end of the year. In mid-January 1946, the ship was slated for inactivation. She was decommissioned at Seattle on 20 March 1946, returned to the War Shipping Administration in April, and struck from the Navy list on 17 April 1946. Tryon was turned over to the United States Army on 17 July 1946 and converted into a troop transport by the Todd Shipyard, Seattle, Washington. She emerged from the yard on 25 August 1947 and was placed in service as USAT Sgt. Charles E. Mower. The Secretary of Defense, by a directive dated 2 August 1949, established a unified sea transportation service; and, on 1 March 1950, the ship was transferred back to the Navy Department, assigned to the Military Sea Transportation Service, and designated T-AP-186. USNS Sgt. Charles E. Mower operated as a dependent transport shuttling between San Francisco and Pearl Harbor until she was inactivated in 1954. Sgt. 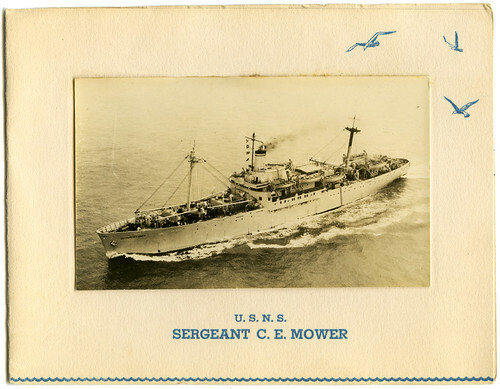 Charles E. Mower was placed out of service, in reserve, on 16 June 1954; transferred to the reserve fleet at Suisun Bay; and struck from the Navy list on 1 July 1960. Okay, I had no idea this little joke in our family had such a history. And what's even stranger is that for a long time I lived near where this ship was mothballed and every time I drove by the mothball fleet in Suisun I was driving by a ship I'd once sailed on. Hadn't a clue. It might still be there. Charles E. Mower (November 29, 1924 - November 3, 1944) was a United States Army soldier and a recipient of the United States military's highest decoration—the Medal of Honor—for his actions in World War II. Mower joined the Army from his birth city of Chippewa Falls, Wisconsin, and by November 3, 1944 was serving as a Sergeant in Company A, 1st Battalion, 34th Infantry Regiment, 24th Infantry Division. During an attack against Japanese positions that day, near Capoocan, Leyte, in the Philippines, Mower took command of his squad after the leader was killed and led his men from an exposed position despite being seriously wounded. He was killed during the battle and, on February 11, 1946, posthumously awarded the Medal of Honor. Mower was buried at the Manila American Cemetery and Memorial in Taguig City, the Philippines. "He was an assistant squad leader in an attack against strongly defended enemy positions on both sides of a stream running through a wooded gulch. As the squad advanced through concentrated fire, the leader was killed and Sgt. Mower assumed command. In order to bring direct fire upon the enemy, he had started to lead his men across the stream, which by this time was churned by machinegun and rifle fire, but he was severely wounded before reaching the opposite bank. After signaling his unit to halt, he realized his own exposed position was the most advantageous point from which to direct the attack, and stood fast. Half submerged, gravely wounded, but refusing to seek shelter or accept aid of any kind, he continued to shout and signal to his squad as he directed it in the destruction of 2 enemy machineguns and numerous riflemen. Discovering that the intrepid man in the stream was largely responsible for the successful action being taken against them, the remaining Japanese concentrated the full force of their firepower upon him, and he was killed while still urging his men on. Sgt. Mower's gallant initiative and heroic determination aided materially in the successful completion of his squad's mission. His magnificent leadership was an inspiration to those with whom he served." To see a photo of Sgt. Charles E. Mower click on this link. Thought I would let you know how we are making out. This is the ship we are on. It is supposed to be the smallest ship on the Hawaii run, and boy does it ever rock. In fact one of the sailors said it would even rock in dry dock. What a crate. We have a nice state room and private bath. The food is excellent. We were late in leaving Frisco so won't arrive until tomorrow (Thursday) in Hawaii. Let me tell you we weren't out of the Golden Gate an hour before everyone aboard started to get sea sick. Sat. night was a rough night. I think every sailor and Marine aboard was sick. Sat. night they only had two guards left on duty and one of them was so sick he could barely hold his head up. Even the poor dog on board was sea sick. Some people are still below in their sacks. We are lucky we are on A deck. They have plenty of entertainment for the kids. Had an Easter party for them. They all got an Easter basket filled with candy. Had a birthday party for them yesterday and there are movies and story hours twice a day." She then goes on to say about me that I was "an old salt. Never phased her" and that I was "running them ragged on deck trying to keep up with me. You should have seen her Sat. night. All night long she slid from one end of the crib to the other and when the ship started to rock she sang 'bye baby bye.'" Apparently I was a bit of an existentialist even at a very young age. And now I find for good reason. My dad informed me this morning when I was discussing this card with him that on the really bad night I was nearly killed by a lamp. My crib was under the port hole. Across cabin was a metal desk with a large heavy brass lamp on top. During the pitching and tossing that night the lamp came flying across the room and just missed me by falling to the floor right before my crib. Eventually we made it to Pearl Harbor and flew to Midway Island. My mother used to tell me about the approach to the island. My dad pointed out the window at the tiny island and said "There's where you're going to live for the next year." My mother was stunned. But other than the lack of fresh food it was apparently a really good year and I have old footage of me running along the beach chasing Gooney birds near rusted wreckage from the Battle of Midway that had occurred a little over ten years before we arrived. I debated whether to put this on my ephemera blog or here in the vernacular photography blog. It was a toss up, could have gone either way. It's a card, it's a photo. It's two, two, two things in one. And now for me Sergeant Mower is two things in one. The ship on which I made my first sailing adventure and a man who gave his life for his country. Sort of an odd mix to find at the bottom of a drawer. UPDATE: Below is a comment I received today from Sgt. Mower's brother. Sir, thank you for honoring me with this message. I would be happy to post any other information you'd like to see on this page. What a surprise finding all of this interest in the ship named after my brother. I'm sure he is looking down reading all the comments and has a big smile. He was a fun loving person, good athlete and loved to fish and hunt. The year '47 when the boat was converted from a hospital ship to troop transport our family was invited for the launching ceremonies. Cars and roads limited travel to about 500 miles in a day. It was quite a trip going from Wisconsin to Seattle, Washington. My parents are now deceased along with one sister. My other sister and I live on the same lake (Wissota) just outside Chippewa Falls, Wisconsin. I'm hoping she will give a report along with our 10 grandchildren. All the families have a picture of the ship hanging on their wall along with the medal of honor citation and picture of my brother. When the ship was moth-balled the Navy sent us the three bronzed plaques that were on the ship giving the medal of honor history. One was given to our local American Legion post, one to our local McDonell High School that we all attended and one is mounted in a stone display in front of our local court house. The medal of honor along with pictures of the ship etc. have been turned over to the Chippewa County Historical Society. Following graduation from high school my brother and two of his best friends (Ken Reiter/Bill O'Neil) decided to sign up for the service rather then waiting to be drafted. They called themselves the Three Musketeers. They first went to the Marines. My brother was color blind so he was turned down but they would accept the other two. They wanted to be together so then went to the Navy. After their physical they got the same story. Because of my brothers color blindness he would not qualify but they would accept his two buddies. They refused to be split up. They then went to the Army. At that time because of the war very few were ever refused. They all signed up together. Their day came when it was time for them to board the bus heading to Milwaukee. They were together until it came time to leave the bus. Then they lined up outside the bus according to alphabet. They never saw each other after that day. I don't want this to be too long. I'll have to think about this some more and may put together another comment or two at a later time. I enjoy all of your comments and thank you so much. My father-in-law, now deceased, worked at the Oakland ship yard as a welder. Perhaps he welded the seams on this ship? Perhaps not, but I do remember him telling me of his trip to Oakland in early 1941 on a Harley-Davidson motorcycle to work in the shipyards. Thanks for the memories! You know, I wouldn't be surprised. Sometimes the world is smaller than I ever imagined. I, with my ordinance officer dad, Mom, and older brother sailed on the Mower from Fort Mason in San Francisco in the Spring of 1950. Although my Dad was from Chicago, my Mom was third generation from Hawaii. Her great-uncle jumped-shipped from the British Navy to marry a lovely 'native' in the late 1880s and had slowly brought over his Mom and dozen siblings from London. For all of us, we were returning 'home' after having been evacuated (as all military dependents were) after the attack on Pearl Harbor. That 1940 trip from Honolulu to Long Beach was on the Aquitania -- honest. I was too young to remember, but my Mom and brother agree it was slow and uncomfortable because all the ships in the convoy had to 'zig-zag' to California because of the fear of submarine attack.) I LOVED the crossing on the Mower. Our dog was in a cage on an upper deck and I spend many hours walking him around with the many other kids and pets. Remember the movies. Our family had a pretty small 'stateroom' but the food was better than I was used to. In Honolulu we were absorbed by our other family members, but my Dad went on to Japan until he secured quarters for his three dependents. I was excited to be heading to Japan. Those dreams ended on June 25, 1950, when North Korea invaded South Korea. My Dad, being 'Johnny on the spot' was immediately transferred to Seoul where he remained through 1953. My later voyages were on progressively larger ships until the 1960s when it became cheaper to fly, but the little Mower has a special place in my heart. Thanks for teaching me more about the Sargeant Mower. Fond memories. Lynn Higgins. Glad you found the post. As you can see, if you go to the other page where this was posted, there have been a lot of folks who have memories of their time aboard the Mower. I never imagined the post would bring back so many memories from so many folks.